Story: Based on the MTV animated series created by Peter Chung, Aeon Flux is set 400 years in the future, when disease has wiped out the majority of the earth's population except for one walled, protected city-state, Bregna, ruled by a congress of scientists. 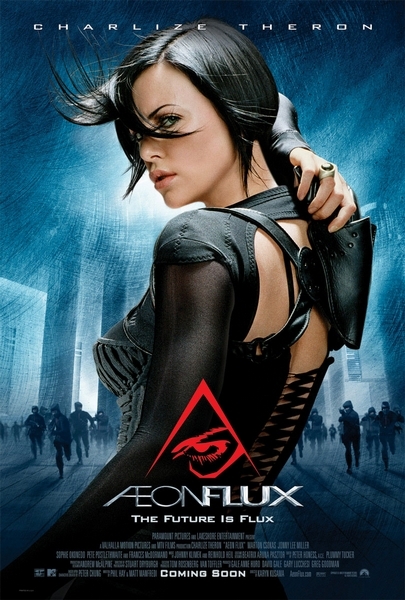 The story centers on Aeon Flux (Charlize Theron), the top operative in the underground 'Monican' rebellion - led by The Handler (Frances McDormand). When Aeon is sent on a mission to kill a government leader, she uncovers a world of secrets. When government agents murder her family, Aeon Flux (Charlize Theron) swears revenge. A highly trained soldier on the front lines of a war against the perfect society, Aeon is one of the few to suspect that this perfect life is hiding a perfect lie. Set in 2415, the film is a startling vision of a future in flux.